The Whitefish River is cold, swift and deep in the early spring, challenging canoeists and providing good steelhead fishing. During the summer, much of the river becomes too shallow for canoeing, but offers fishing for brook trout in the upper reaches and a variety of warm water species downstream from the confluence of the East and West Branches. The Whitefish River canoe trail offers approximately 28 miles of good canoeing. It offers the canoer two trails, the East Branch is approximately 8 miles longer than the West Branch. Two and a half miles south of FR-2236, the two branches converge and flow past the bridge on U.S. 2 and onto the public boat launch site at Rapid River. Deer, waterfowl, and bird sightings (including bald eagles) are common. Designated Reach: March 3, 1992. The main stem from its confluence with the East and West Branches to Lake Michigan. The East Branch from the crossing of County Road 003 to its confluence with the West Branch. The West Branch from County Road 444 to its confluence with the East Branch. Classification/Mileage: Scenic -- 31.5 miles; Recreational -- 2.1 miles; Total -- 33.6 miles. 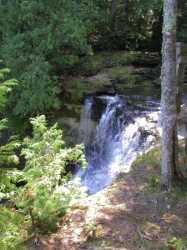 The Whitefish River canoe trail offers approximately 28 miles of good canoeing in the Hiawatha National Forest. It offers the canoer two trails, the East Branch is approximately 8 miles longer than the West Branch. Two and a half miles south of FR-2236, the two branches converge and flow past the bridge on U.S. 2 and onto the public boat launch site at Rapid River. Deer, waterfowl, and bird sightings (including bald eagles) are common. In very early spring the river can be deep, swift, and cold. Canoeing at this time can be dangerous and should be left to experienced canoeist wearing wet suits. The best time to canoe is from April 30th, when the river is high and wild, to the end of June when the water level is low. It may be necessary to tow through some shallow, rocky areas when the water level is low. There is a mixture of private and National Forest lands all along the course of the river. Be sure to check your map and respect the property rights of others.